I also thank Antonella and Barbara Sereni for the tedious preparation in the days before the shoot, the professionalism they demonstrated all throughout and the hard work they put in to get the job done. Anyone who has done a real, professional photo shoot knows what I am talking about. It is much, much harder work than I ever imagined. And now, the rest of the story behind the pictures. When I was five years old my dad held me in his lap and showed me pictures of Italian Renaissance paintings. A vivid memory of those faraway days was seeing Boticelli’s “Nascere del Venere” ( The Birth of Venus ), to this day one of my favourite paintings of all time. I can still hear his voice explaining to me how Venus was the most beautiful woman in the world and remember how I protested “But dad, she’s not beautiful!”. I thought Barbie was beautiful, I guess! 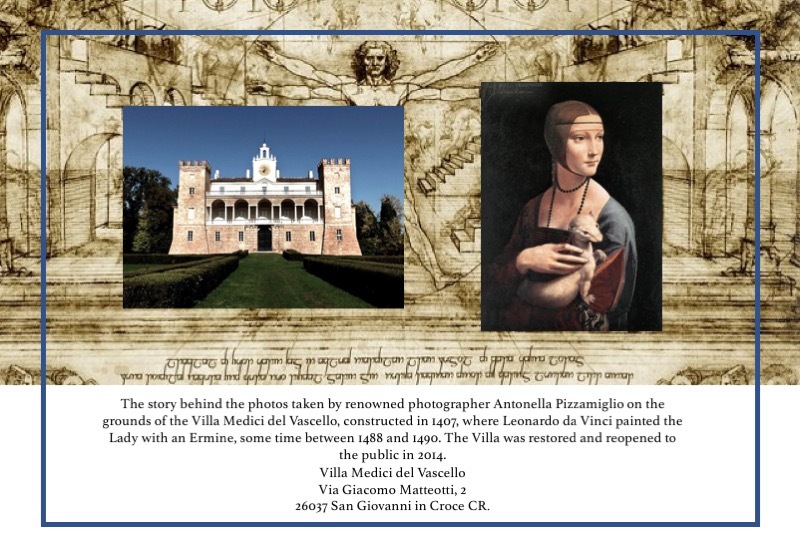 I truly believe that it was that love of the Italian masters Botticelli, Michelangelo and da Vinci instilled in me from a very young age, thanks to my father, that eventually led me to set up life and settle definitively in Italy. I got the “Cappuccino Eyes” disease on my first trip here. I felt deeply touched by the symbolism of the ermine in the dama’s lap. All of my life I’ve strived to get back the purity that I felt I lost early on, in the sense of feeling deeply flawed. If anyone is ever curious as to why I often dress in white, that is why. Oh, and because I keep hoping to roll on the beach in the sand with Kris Kristofferson in my own reality show movie version of “A Star is Born”! Apart from the elegance of black and white photos, the effects of natural chiaroscuro are more evident which is one of the reasons I decided to have the photos converted to black and white. From the day my 11th grade English teacher Aretha Moody blew my mind away reading us an essay on how life is a paradox and from the moment I started writing songs, I have employed a line in my lyrics which exemplifies it when I can, and I like thinking of how chiaroscuro expresses paradox visually. Though I am an artist with the vices of an artist (sometimes spacey, a bit chaotic in my lifestyle, and somewhat disorganized), I do work at improving my weak areas. I turn to the scientists and mathematicians hoping their concrete and ordered thinking will rub off on me. I have enjoyed many of the lectures on PBS Spacetime. Stephen Hawking was a true hero for me. I like falling asleep listening to lectures in Physics ( from Edward Witten to Max Tegmark ) and it is wonderful how youtube makes that possible. My favourite subject in Science was Astronomy, and though I understand the physics behind it very little, it fascinates me. I adore Star Trek, especially the latest movie trilogy! I hope people can sense the Science and Art, the paradox, the rational and irrational in my thinking and music. I hope people who have never meditated will be inspired to give meditating a try, to learn how to recognize and distinguish their irrational thoughts from their rational ones, to discover what kind of beliefs are governing their life in a scientific way and to weed out the harmful, unhealthy and unhelpful. In conclusion, I would like to point out a few things in the design of my website that may not strike the observer in a conscious way and leave it to my readers and listeners on how to interpret it. Note that all background photos of the seven main pages are divided into left/right. The temple is always on the left. I am leaving the temple. The temple is old and crumbling in places, but it is still standing. I am moving towards water and nature. In the last photo, on the contact page, there is no temple: there’s me, my guitar, water and nature. Meditating. And there is no spoon.